Cybercrooks target busy holiday shoppers with phishing scheme. After all that shopping on Black Friday and Cyber Monday, consumers are reporting a bunch of phishing emails that look like authentic communications from poular stores. 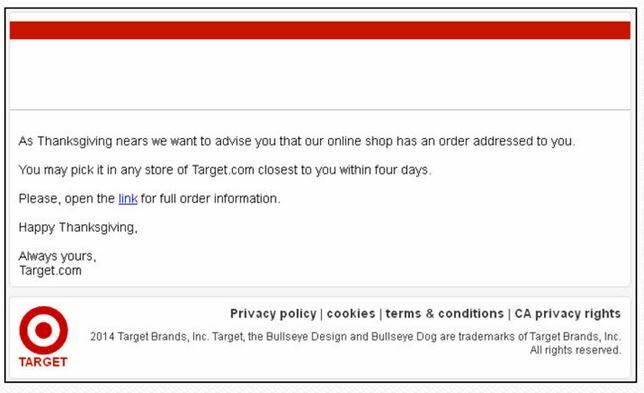 Malware-infected emails are reportedly coming from Walmart, Home Depot, Target, and Costco. The catch is these are not from the authentic merchants, but rather cybercrooks are using a phishing scheme to send fake emails with the intent to gather personal information from harried shoppers. Millions of these emails are being sent each day, originating from more than 600 hacked websites that act as intermediaries, according to security analysts from Malcovery monitoring the attacks. This method prevented detection by causing the spammed links to point to websites that had been safe until the morning of the attack. If you receive one of these emails, don’t click on any links. Instead, visit the merchant’s website or call their customer service. Don’t give any personal information out unless you know for sure with whom you are speaking. Unfortunately, cybercrooks are becoming more professional with their scams, but here are a few things you can look for to tell a fake email from an authentic one. There is no order confirmation number or details about the order. A real order confirmation email contains the details of your order without clicking on any links, as well as where it is being shipped and the payment method. 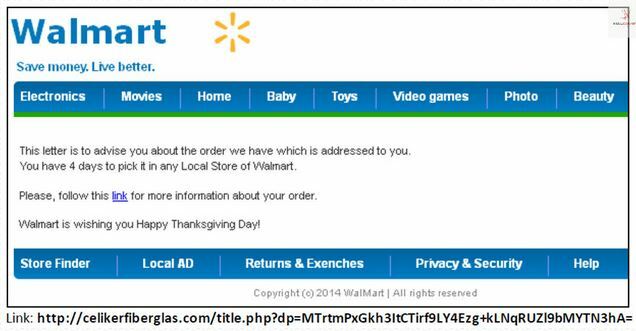 Walmart acknowledged that the fraudulent emails were in circulation and suggested these steps if you receive a suspicious email. If you actually placed an order and are suspicious about the email you received, log onto your Walmart.com order to check your order status. Keep your virus software updated on all your computers. If you were a victim of fraud via the Internet, you should file a report with your local law enforcement agency along with the Internet Crime Complaint Center (ICCC). The ICCC is a partnership between the FBI and the National White Collar Crime Center. You can make a report with the ICCC.